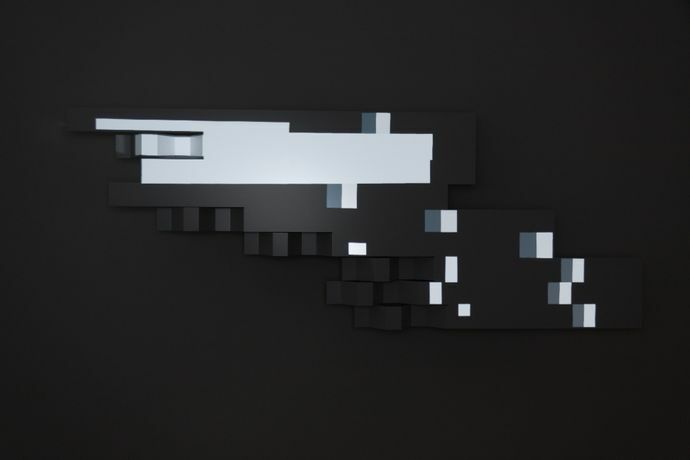 PROCESS is a generative audiovisual media installation that is based on curiosity about the limits of using generative media production tools and technology. The installation PROCESS is a set of algorithms that interact with each other and make partly predictable result. The goal of this work is to show how many different sound and visual variations it is possible to create by using the same algorithm. 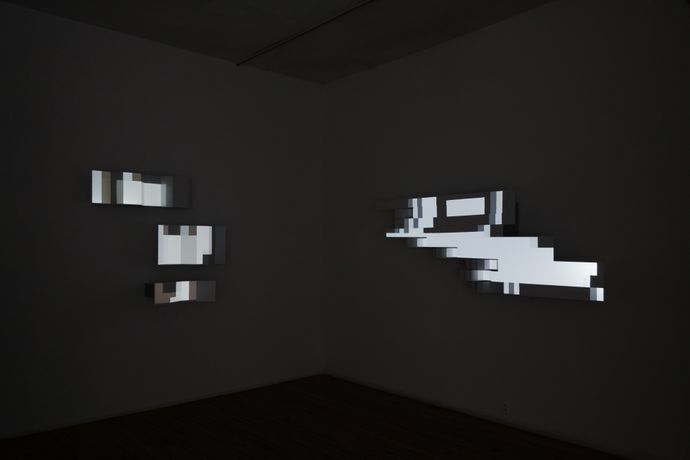 Three­dimensional surfaces are used as screens for video and generative animations. There are several generative and designed sound sources connected to visual compositions ­ all­together forming one bigger composition consisting of six parts that will be running in a loop. Each loop starts with the same impulse and ends with an algorithmically predictable yet different audiovisual culmination. PROCESS is a composition of 11 objects that are dispersed in space. For the first time one part of the artwork was exhibited at the gallery SPACES in Cleveland (U.S.) in 2014, supported by CEC ArtsLink Artist in Residence program in New York. The complete artwork will now be exhibited at SPEKTRUM. Sponsors: CEC ArtsLink, The National Endowment for the Arts, Ohio Arts Council, The Andy Warhol Foundation for the Visual Arts, The State Culture Capital Foundation of Latvia (SCCF). Irina Spicaka​ is a Berlin­-based new media artist, creative coding and audiovisual events curator working in the field since 2005. 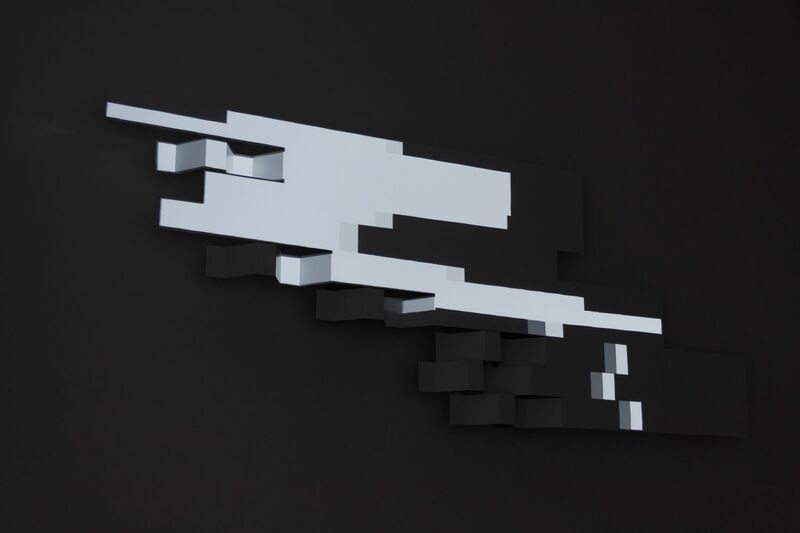 She uses projection mapping as the main medium for her artistic expression and is interested in the conceptual aspects of it. She also uses video, sound, interactive and generative methods for creating audiovisual content. On daily basis she works as the lead graphic, user experience designer and style guide artist at a startup in Berlin. Krisjanis Rijnieks is an artist and full stack developer currently working at the Fab Lab Berlin. He works with digital interactive media since 2002. During last 4 years he has worked on different projects that include creative coding (using tools like openFrameworks, Arduino, Raspberry Pi) and projection mapping techniques. He is the author of ofxPiMapper and is looking forward to make it as good and easy to use as possible. Their main collaborations so far include:​ Click festival in Denmark, Fab Lab Berlin, Open Innovation Space, School of Machines, Making and Make-Believe and Betahaus educational platforms in Berlin, CEC ArtsLink residency in New York, Spaces gallery in Cleveland (US), Aalto Node gallery, Aalto Fab Lab, Media Factory and Pixelache platform in Finland, Media Histories Conference and Renew festival, new media center and gallery RIXC, sound festival Skaņu mežs, Festival of Lights in Riga, Latvia. Works of both artists have been exhibited in Italy, Spain, and Turkey.